I came across an ingenious simulation by Perron during my Time-series lecture which I thought was worth sharing. The idea was to put your model to a further test of breaking trend before accepting the null of unit root. Let me try and illustrate this in simple language. (2) Difference stationary (DS) models, which are suitable for models having a stochastic trend. The DS models are appropriate for models that have a unit root in the AR polynomial. Unit root in the AR polynomial means that the trend part in the series cannot be represented by a simple linear trend with time (a + bt). And the correct representation is (1 – B)zt = a + et, where et is i.i.d. The asymptotic properties of the estimates, forecasts and forecast errors vary substantially between the TS and DS models. (For the ones interested in the algebra behind this, lecture notes of Dr. Krishnan are here) Therefore it is important for us be sure that the model belongs to the appropriate class before we fit a TS or DS model. This is the reason why the clash between the two school of thoughts has bred enormous literature and discussions on the methodology to check for unit roots. One could try and endlessly argue about these discussions but I want to illustrate the genius of Perron who criticized the idea of fitting a DS model to series that could have a structural breaks. He said that you ought to take into account the structural break before you check for the unit roots, if you don't do so, you might end up accepting the null of unit root, even when the true data generating process (DGP) is a trend stationary process. He illustrated this using a simple, but very elegant, simulation exercise. Madhav and I, along with fine-tuning on the codes provided by Utkarsh, replicated this exercise with R.
where et ­are i.i.d innovations and t = 1,2,3,...100. For simplicity I have assumed b = 1 and u1 = 0. 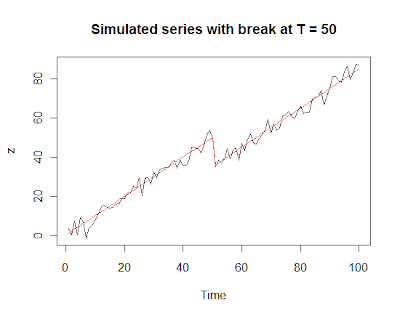 (2) Assume that there is a crash at time Tb = 50 and the entire series comes down by amount u2. 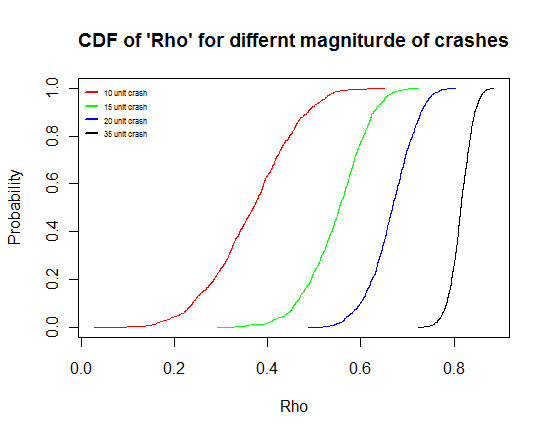 (4) Plot the cumulative distribution function (c.d.f) of “rho” for different values of u2 (crash). sim <- function(crash) ## Function name "sim"
## saving the simulated series in "d"
coefficient of the fitted AR(1) model above. ## Plotting all the CDF of rho for different magnitude in one plot. An interesting observation that we make (or rather Perron made) is that the c.d.f of our autoregressive coefficient “rho” tends more towards unity with increase in the magnitude in crash. What this means is that as the magnitude of crash increases the possibility of your accepting the (false) null of unit root increases. Why I say the false null is because I know the true DGP is a trend stationary one. This idea of Perron was criticised on the ground that he was specifying the break point (Tb) exogenously, that is from outside the DGP. Frankly speaking I do not understand why was this taken as a criticism. I think fixing the break point exogenously was a good way of fixing it with an economic intuition and not making is a purely statistical exercise. Some researchers (I don’t understand why) termed this (simulation) illustration as a “data mining” exercise, and improved it by selecting the break point (Tb) endogenously (by Zivot and Andrews as mentioned in the lecture notes). I would hate to impose my opinion here but I feel this was a very elegant and logical way of driving home the point that the null of unit root should be accepted for your sample if and only if your model stands the test of extreme rigour and not otherwise, and the rigour could be imposed exogenously with economic intuition too. P.S. 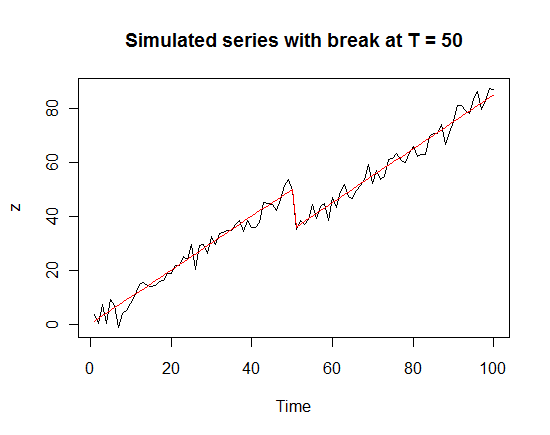 Perron did a similar simulation for breaking trend model, i.e where the slope of the model had a structural break. The codes would be quite similar to the ones given above, in fact it would be a good practice if you could do the similar simulation for a breaking trend. In case you do want to try but face any issues please feel free to post/email your queries. Shreyes, I wish I could understand this post, but I don't. My level in R does not allow me to understand the code, it is nevertheless imperative for me to understand it. If I have your email address, I'll give you some suggestions. If you are the student of time series analysis I would urge you to read through the lecture noted of Dr. Krishnan that I have mentioned above in the post. (it also has the algebra behind the ADF test) It would help you appreciate the background of the discussion apart from the R codes. Feel free to email me at shreyes.upadhyay@gmail.com for any suggestions. Oh yes, I am currently studying time series analysis and that's why I love your blogspot because I have found so many relevant posts that have greatly helped me. Great work man very helpful. do know wer i can find help with the lm unit root test wit 2 breaks or more? ?